Persons with disabilities around the world encounter barriers to their political participation, and countries like Georgia are taking steps toward more inclusive policies and practices. In December 2013, Georgia ratified the UN Convention on the Rights of Persons with Disabilities (CRPD), which calls on states to recognize rights and to adopt the appropriate measures to ensure that those rights are fully enjoyed by persons with disabilities. The treaty also requires periodic reporting to the CRPD Committee on the current status of persons with disabilities and encourages governments, disabled persons’ organizations (DPOs), and human rights groups to develop a shadow report. In Georgia, the Public Defender’s Office took the lead in coordinating the drafting of the CRPD shadow report. The Public Defender’s Office and local DPOs attended a training on monitoring the CRPD facilitated by the International Foundation for Electoral Systems (IFES) on November 14-22, 2015. The training covered the steps required to draft a shadow report for the CRPD Committee and to identify possible gaps in technical knowledge, as well as existing resources and allies within the country. The Public Defender’s Office and DPOs discussed plans for monitoring the CRPD and potential concerns about the monitoring process. This program uniquely connected a government body in Georgia responsible for reporting on rights for persons with disabilities with DPOs advocating for those rights and focused on several priority CRPD articles during the course of the training, including Article 12 (Equal Recognition Before the Law), Article 24 (Education), Article 27 (Employment and Work) and Article 29 (Participation in Political and Public Life). Participants utilized their extensive knowledge of the CRPD to produce and adopt a work plan for the shadow report, which acknowledged the importance of including persons with disabilities and DPOs in every step of the process. Additionally, IFES led a roundtable during prior to the workshop that highlighted important aspects about the relationship of the CRPD to experiences of persons with disabilities. 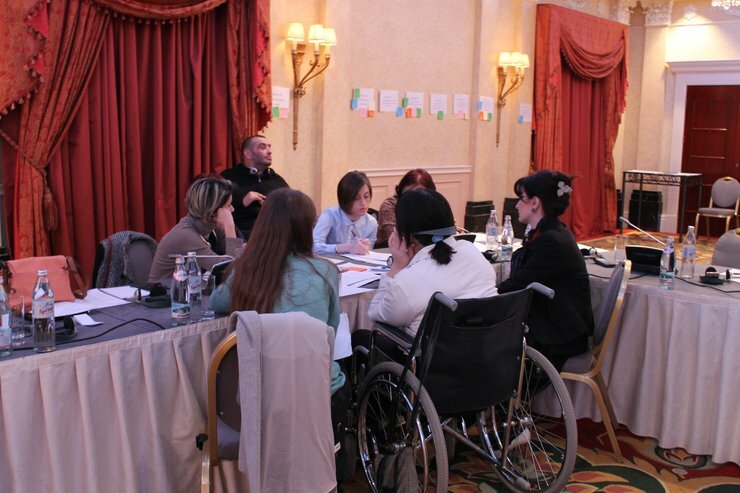 The discussion included ten Georgian youth with disabilities, who, through their knowledge of the CRPD and local laws, advocated for greater youth involvement in the disability community and DPOs. The DPOs and advocates from the Public Defender’s Office who were engaged in this training developed a more substantial understanding of challenges faced by persons with disabilities in the political and legal spheres, as well as developing recommendations for next steps on the CRPD shadow report. DPOs engaged directly with the Public Defender’s Office, allowing for the exchange of ideas and best practices. Working with DPOs had a critical impact on the CRPD report.